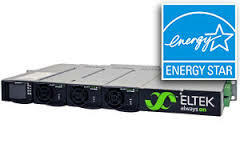 The Eltek Flatpack S 1U Intrepid Series High Efficiency DC Power System answers the call for increasing network speed demands and flexible and expandable DC power solutions. Due to its small size, high efficiency, reliability and wide range of communication, the Flatpack S Intrepid Series System is the key for future needs. The shallow depth makes the system suitable for most cabinets and thereby excellent as a replacement unit. The Eltek Flatpack S 1U system is an optimal footprint for applications where space is limited – both in racks and various cabinet installations. The Flatpack S 1U is a one rack-unit high system that delivers 48V DC power to telecom infrastructure. The compact size of the system makes it perfect for use in 19″ or 23″ wide racks and cabinets. Built as a plug-and-play system, the Flatpack S 1U reduces installation time and enables cost-effective deployment. Small overall dimensions are ideal for both rack and cabinet applications. DC loads and controller connections (alarms, communication, etc.) are front accessible. The AC connections and battery connections are rear. The Smartpack S digital controller system provides comprehensive monitoring and regulation by utilizing a variety of specialized data collection. Flatpack S modules feature front-to-back airflow and chassis-integrated heat-sinks, supplementing high-efficiency energy conversion with excellent heat management. A true plug-and-play system, the Flatpack S 1U system reduces both time to-install and overall costs.